Korean watercolour artist Mina specialises in painting flowers and plants. 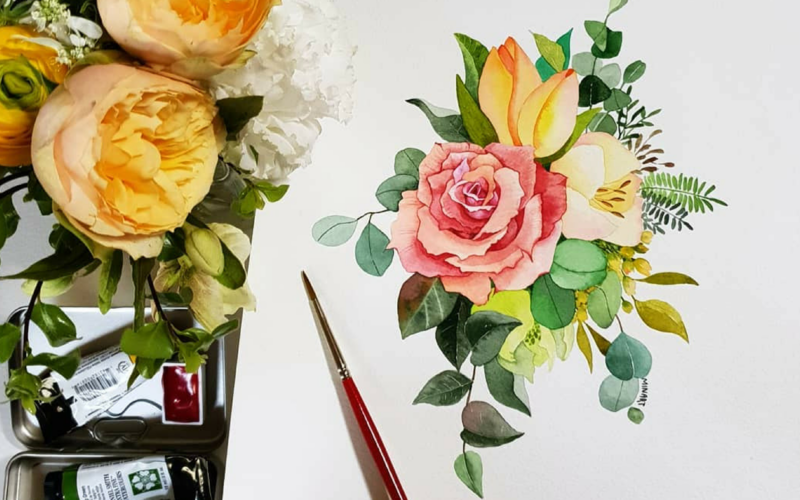 While there's no question that her artwork is beautiful, watching her careful blending of watercolours will certainly leave you mesmerised. Art comes in many forms and Annette's unique medium of choice is frozen paint, which she uses to craft delicate sculptures before mashing them up in her videos. They're extremely addictive and soothing to watch. Thought you had good handwriting? Think again. You might find yourself falling into a trance as you watch master calligrapher King Blotto III’s words gliding gracefully across sheets of paper. Mary, the founder of Emma Sweets in Barrie, Ontario, demonstrates how she decorates the bakery's adorable cookies and cakes. Her feed will not only leave you spellbound—it’ll also whet your appetite. Feel a deep sense of satisfaction as you watch these videos of kinetic sand being cut, moulded and shaped. With over 294k followers and counting, it’s clear that the art of sand cutting has gained a cult following on the Internet. Sparkles and glitter are a surefire way to lift your mood. Add slime to the mix (literally) and what you get is a feed full of captivating videos. Warning: you’ll definitely want a jar of your own after watching these clips. From life-size calligraphy to hypnotic patterns, Seb Lester uses a mix of traditional and modern tools in his time-lapse creations. They're super satisfying to watch—and his one million fans can attest to that. Potter and owner of Tortus Studio in Copenhagen, Eric has gained an audience of almost 800k with his calming videos of pottery making. It's inspiring to watch as he transforms lumps of clay into beautiful, hand-made ceramic masterpieces. Fine art student Karen's Instagram feed is a colourful work of art in itself, and her playful—almost magical—time-lapse videos take her followers on a journey as she experiments with new mediums. Cake decorating videos have taken social media by storm and Chelsey feeds her audience with hypnotic videos that show the making of her ultra-pretty creations.